Until the last days of his life, half of which he spent behind bars for killing a police officer, William “Lefty’’ Gilday insisted he never pulled the trigger. 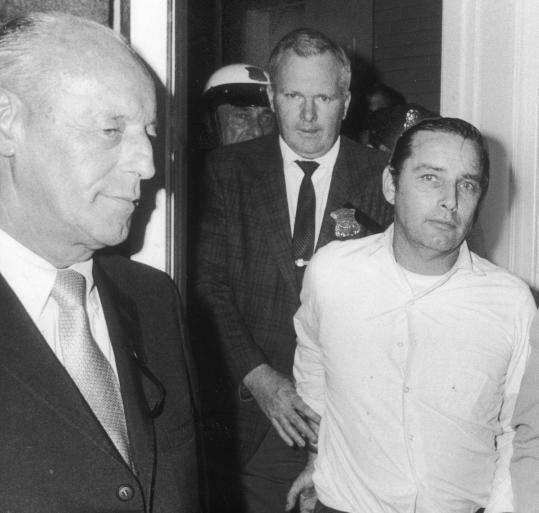 Among the state’s most notorious criminals, Gilday led hundreds of police officers on a bullet-filled chase over a week in 1970, the largest manhunt in New England history. He remained unapologetic until an interview in June, his last before he died last Saturday in a Boston hospital. At 82 and suffering from an advancing case of Parkinson’s disease, Gilday finally acknowledged responsibility for the slaying four decades ago of Boston Patrolman Walter Schroeder, after whom the city named its police headquarters. After spending the day curled up on the starchy sheets of a bed in the health unit of MCI-Shirley, the balding inmate sat up, straightened his pajamas, and donned a pair of thick prison-issued glasses. His words were labored, his hearing fading, his hands shaking as he recalled the day that led to his final arrest, after years of other crimes. Still, he had a lucid memory of the morning of Sept. 23, 1970, when he helped a radical group from the Weather Underground rob a Brighton branch of the State Street Bank and Trust Co.
“I wish we never would have gone to the bank that day,’’ he said of the group’s failed effort to finance their movement against the Vietnam War. He recalled the dismal haul - $26,585 - and the others who participated in the infamous robbery, including Stanley Bond, who died two years later, when a bomb he built to escape the maximum-security prison in Walpole detonated prematurely; Robert Valeri and Michael Fleisher, who both testified against Gilday and were released after serving short sentences; Susan Saxe, who was on the lam for five years before she was arrested and sentenced to seven years in prison; and Katherine Anne Power, who eluded authorities until 1993, when she turned herself in and served six years in prison. When asked whether he would acknowledge his guilt in the shooting of Schroeder, who was responding to the robbery, Gilday took a long pause. He said the copper-plated military-grade ammunition ricocheted off a brick wall before felling the police officer, who was considered a hero on the force for his bravery in responding to similar robberies. He said the officer was not targeted but hit accidentally, when Gilday and his fellow thieves decided it would be a good idea to fire a few shots at the bank to keep anyone from following them. After another pause, he insisted he didn’t pull the trigger, pointing the finger at others in the group. But when asked if he felt at least partly responsible for Schroeder’s death, he bowed his head. “Of course I do,’’ he said. Schroeder’s relatives, reached a few weeks before Gilday’s death, said it was too late for any condolence. Schroeder, who was 42 years old, had been a police officer for 19 years and was the father of nine children. His brother, John Schroeder, a detective on the force, was shot and killed in the line of duty three years later. Other relatives did not return calls yesterday, and Erin Schroeder could not be reached. Boston police and the Suffolk district attorney’s office declined to comment yesterday. An aspiring baseball player from Amesbury, Gilday had a long criminal record before he shot Schroeder, with charges dating back to 1947 that include armed robbery, concealed weapons, and assault with a deadly weapon. In 1964 he was sentenced to serve up to 25 years for armed robbery. He served only five. While in prison he met Bond, and the two enrolled in a university program for inmates. It didn’t take long before they got caught up in the radical politics of the era, and the two joined a group called Students for a Democratic Society and later the Weather Underground. They allegedly robbed other banks and led an assault on a National Guard armory in Newburyport. Gilday ran in part because he thought he would not have survive his arrest. Joe Hamel, 67, a news photographer for Channel 27 in Worcester at the time, witnessed Gilday’s capture and said the fugitive later thanked him for saving his life. After Gilday’s arrest in Worcester and trial in Suffolk Superior Court in 1972, he was sentenced to death. But his life was spared by a US Supreme Court decision that overturned the death penalty nationwide. Over his 41 years in prison, Gilday made a name for himself as a smart jailhouse lawyer. Jim Pingeon, litigation director at the Massachusetts Correctional Legal Services, a nonprofit prisoners’ rights group, said Gilday helped reform the prison system with lawsuits against the state Department of Correction. With mixed success, he fought the department’s practice of listening in on prisoners’ phone calls and opening their outgoing mail. “He was definitely a leader among prisoners,’’ Pingeon said. Steven Rappaport, a Lowell lawyer who worked as an advocate for prisoner rights in the 1970s, said he considered Gilday a friend who taught him a lot over the years. The two met when Gilday served as head of the MCI-Norfolk prisoner advocacy council. The last time he heard from Gilday was in May, when he received a letter in which the inmate complained about inadequate medical care. In his hospital cell at MCI-Shirley, Gilday said he took pride in fighting the system and took his long years behind bars in stride.